Brilliant chemist Maggie Bell has a knack for choosing Mr. Wrong, and with yet another lonely Christmas looming, she decides it's time to alter the equation--and seek out someone who seems totally wrong for her. Eureka! The heart is a genius. . . Behind on her bills, B&B owner Hope receives an unlikely guest--stranded solicitor Danny, who's been threatening to put her out of business. Funny how the holidays can bring people together no matter how much they resist. . .
Born rebel or overgrown man child, Matt is the kind of man no woman can tame--until an unexpected encounter with his nemesis, Cami, at the office holiday party proves there's an exception to every rule. . .
Great Read!! 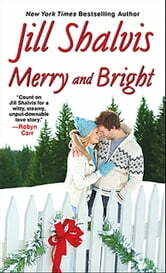 Three Stories of Christmas Romance!! Easy Read for the Holidays✴ Would really recommend this book!